The city of Sravasti is one of the most important of India’s ancient cities not only from a religious perspective, but also from that of learning, culture, architecture and art. Sravasti is famous for being the seat of Lord Buddha and the centre of entrenchment of Buddhism during the lifetime of the Buddha. However, Sravasti is an equally important centre for the Jains, as Tirthankara Shambhavanath was born there. Sravasti is located in the fertile Gangetic plains in present-day Uttar Pradesh and is 170 km north-east of Lucknow. In the Ramayana, Sravasti is mentioned as created as the capital city for Lav to rule over his part of the kingdom of Kosala, when Lord Rama divided his kingdom between his two sons. Lav ruled from Sravasti while Kush ruled from Kushavati. The Mahabharata states that Sravasti was named after the legendary king Sravasta of the Suryavanshi (Solar dynasty) lineage, who had founded the city. The city is situated on the banks of the Rapti River (then called Achiravati) and was a peaceful one with expansive agricultural tracts of land. In the 6th century BC, King Prasenajit of the Ikshvaku clan (Suryavanshi line of Lord Rama) ruled over the region and had his capital at Sravasti. It was during the reign of King Prasenajit that Lord Buddha arrived and started staying in Sravasti. The treatise ‘Brihatkalpa’ mentions that in the 14th century, this city was called Maheth and was a part of the twin establishment of Saheth-Maheth in the area. It is said that it is in the ruins found in Maheth that the ancient city of Shravasti stood. Excavations in the Saheth-Maheth region by Alexander Cunningham in 1863, have yielded sufficient evidences to validate this theory. Buddha came to Sravasti at the invitation of a merchant named Sudatta who had met him at Rajagriha (Rajgir), the capital of Magadha. Sudatta wished to build a monastery for Buddha in Sravasti and devoted all his wealth for that. The monastery was built on an expansive garden owned by King Prasenajit’s son Jeta. Legend has it that Jeta asked Sudatta to cover the garden with gold as the price for purchasing the land, and when the devoted merchant painstakingly did so, the surprised Jeta had a change of heart and donated the wood of the trees in the garden to build the monastery. Thus the monastery came to be known as the ‘Jetavana mahavihara’. The other Buddhist monasteries in Shravasti were the Pubbarama and the Rajakarama, the latter being built by King Prasenajit himself. Buddha stayed for 24 Chaturmasas (a holy period of four months in a year) in Sravasti, of which 19 were spent in Jetavana and the rest in Pubbarama. Buddha is said to have performed miracles in Sravasti, including the very famous ‘twin miracle’ where simultaneously he had fire coming out of his shoulders and streams of water from his feet, thus representing the control of opposite elements of nature within his own self. A considerable amount of Buddha’s preaching and sermons were delivered from Sravasti. The later glorious period of Sravasti was during the rule of Emperor Ashok and then his grandson Samrat Samprati. Both of them upheld Buddhism in a glorious way and built a lot of Stupas and Buddhist temples in Sravasti. The ancient city of Sravasti, which originally stood at the site of the twin establishments Saheth-Maheth saw decline since the 2nd and 3rd century. However, the modern Sravasti grew just on the outskirts of the ancient ruins and the settlement of its people gradually shifted to the new city. The city is mentioned in the ‘Brihatakalpa’ as a prosperous and prominent township in the Gupta period (4th – 5th century AD). Chinese monks Fa Hien and Hieuen Tsang both of whom visited Sravasti (in different centuries) during their travels in India write about the city as a flourishing Buddhist habitation. Their accounts also mention about the ancient city in ruins, which however seemed to be well preserved and frequently visited by people. However, by 900 AD, as the political scenario across the Gangetic plains of northern India changed and Kannauj assumed the imperial position as capital of an undivided Hindu India (northern region only), Sravasti came to be ruled by a dynasty of Jain kings. King Mayuradhwaj ruled over Sravasti in 900 AD, and is said to have also changed the name of the city to ‘Manikapuri’. For the next one hundred years, the Jain kings Hansadhwaj, Makaradhwaj, Shudhavadhwaj and Suhridhwaj ruled over the city and the neighbouring region. This period marked the phenomenal rise of Jainism in Sravasti and the establishment of a number of Jain temples, thus making the city an important religious centre for the Jains. King Suhridhwaj is credited with defending Sravasti and its temples against the invading Muslim forces in the early 11th century. However, by the 13th century, as the entire northern part of India was swamped by rapid Islamization, Sravasti was attacked and pillaged by Alauddin Khilji, who destroyed many temples and shrines in the city. Sravasti does not offer an independent history of its own during the medieval period when India passed under the Muslim rulers of Delhi. The region was governed by the subahdars (governors) of the Delhi Sultanate kings and later the Mughals. During the reign of the Nawabs of Awadh and later the British Raj, Sravasti became a part of the majestic province of Awadh, however it continued to remain insignificant from a political or historical perspective. The sites of Saheth and Maheth are considered to be the location of the ancient Sravasti. Maheth was the city where people lived while Saheth was the location of the Jetavana monastery. 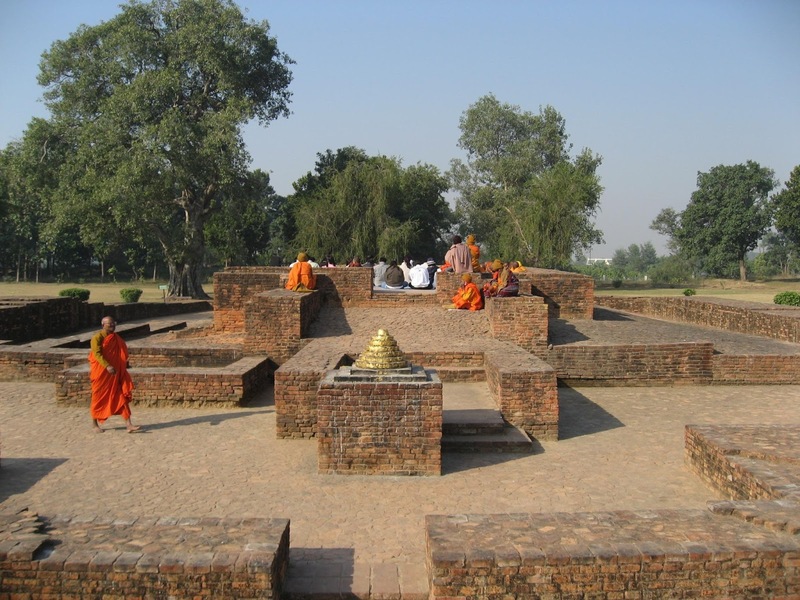 The walls of ancient Sravasti still stand and they encompass the ruins of the stupas of Sudatta (the merchant who originally invited Buddha to the city) and Angulimala (a fierce dacoit whom Buddha had converted to a monk). The stupa marking the site of Buddha’s famous ‘twin miracle’ is also located just outside the walls of the ancient city. At Saheth, the ruins of Jetavana monastery can still be seen. It includes the ‘Gandhakuti’ – Buddha’s hut and abode in Sravasti where he spent for 25 rainy seasons, and the Ananda-Bodhi tree which is believed to have been planted by Sudatta after Buddha’s arrival in Sravasti and under which Buddha preached. Buddhists consider the Ananda-Bodhi tree to be the second most sacred tree after the Maha-Bodhi tree in Bodh Gaya, under which Buddha attained enlightenment. Photo: Ruins of Gandhakuti – Buddha’s hut, ancient Sravasti. I am participating in the #BlogchatterA2Z challenge and today’s letter is ‘S’. I love the photo with the monks in orange robes. One more city with the relevant history covered. Great going. Thank you Jai.. Yes, a few more to go as we travel up to Z ! I look forward to each post of yours because there's so much to learn and discover from them. Sravasti reminds me the poem of Jivananda Das (Banalata Sen), where I read the term "Sravastir Karukarjo". I always have quest to know about Sravasti and its art. Am so happy to know such details about Sravasti. It's a really nice post. You are right Sayanti ! Thanks for identifying the connection to the poem 'Bonolata Sen' ! Sravasti was indeed a city famed for its intricate art on the Buddhist stupas and monasteries, and Jibanananda Das referred to it in his poem to describe his muse !